I’m not diving into dumpsters but I always find them as a good source of color, texture and abstract lines. The more beat-up and left to rot the better. Like yesterday, I took this photo during the day as part of my “shoot anything and everything” strategy. Even when I have a few shots from the day, I usually like to head out on the streets to purposely look around for things to photograph. But the past few days I have been laying low and working with my photos from the day instead of running around town. I’ll probably go back out and about tomorrow to break it up a little so, who knows what I’ll find?! This is a relatively straightforward shot with some color and curves enhancements to bring out the nice texture. Since it is a vertical orientation I cropped it to a 4:3 ratio which I find more pleasing than the normal 3:2 ratio. Pentax K20D, DA 17-70. Wonderful shot! 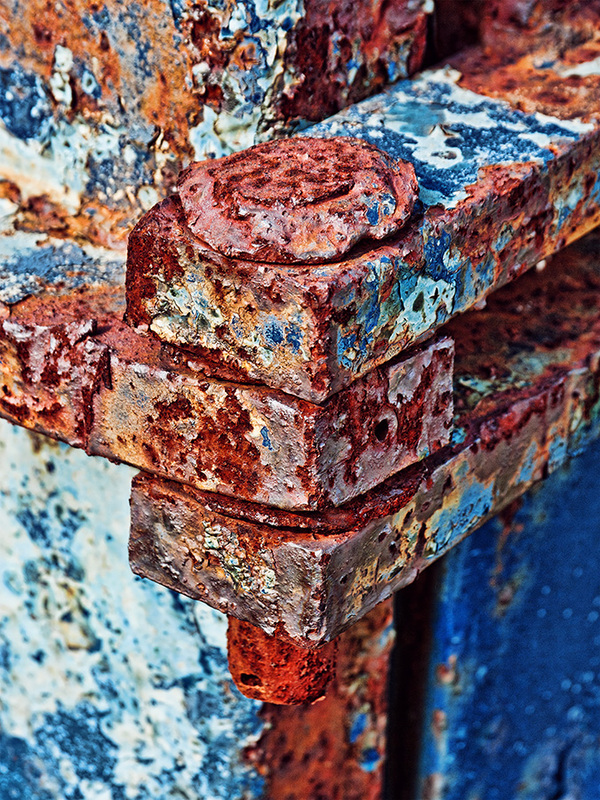 I love the brilliant colours, amazing what rust can do. Not many people think to photograph bins we put our waste in – awesome eye. Thank you Alexis. I enjoy the challenge in photographing the overlooked.